By Matt Kindt, Clayton Crain, Ryan Sook, Ryan Lee, Allan Passalaqua. If the story of Rai were a movie produced and directed by James Cameron, it would make a billion dollars and children 25 years from now would still watch it with awe. It would be a mix of Avatar, Minority Report, Total Recall, and films that have not even been imagined yet. From the very first issue (Rai #1) of writer Matt Kind’s science-fiction epic series, each issue of Rai has been a monument of artistic talent, beauty, and color. Issue after issue, Rai has proven to be a consistently solid title that does not disappoint. It is a series that can be enhanced by reading other Valiant books (Ivar, Timewalker; Book of Death: The Fall of Ninjak; Book of Death: The Fall of Bloodshot; Eternal Warrior #5-8), but does not require the reader to do so. It flows, and builds upon each issue. It has been both fantastic and enjoyable. Rai #10 continues that tradition of excellence. Kindt has masterfully penned each issue leading to this point, with anticipation building more and more as we read. The writing is completely original, engaging, and fresh with each page seamlessly building upon the last. Hell, there has not been a bad issue yet, only chapters of a larger story that from time to time focused on character development as a vehicle to expand the story. Kindt really has nailed this series and clearly this issue, as he might be expected to. Where will Kindt take us? Those who know the Valiant Universe quite well can certainly guess, and perhaps be correct; however, for fans and reader both old and new, this is a journey worth embarking upon that has no downside. If Kindt has designed this amazing world and the story behind it all, fan-favorite and renown artist/painter Clayton Crain brings it all to life with a unique and remarkable artistic style! Each issue is packed with deeply vibrant colors and a rich texture that is completely one-of-a-kind. Crain’s work on this (and all issues of Rai) is truly breathtaking and without equal. It is a magical creation that all but demands a closer look, and asks anyone who appreciates quality art to pick-up a copy of this visually stunning and solid title. 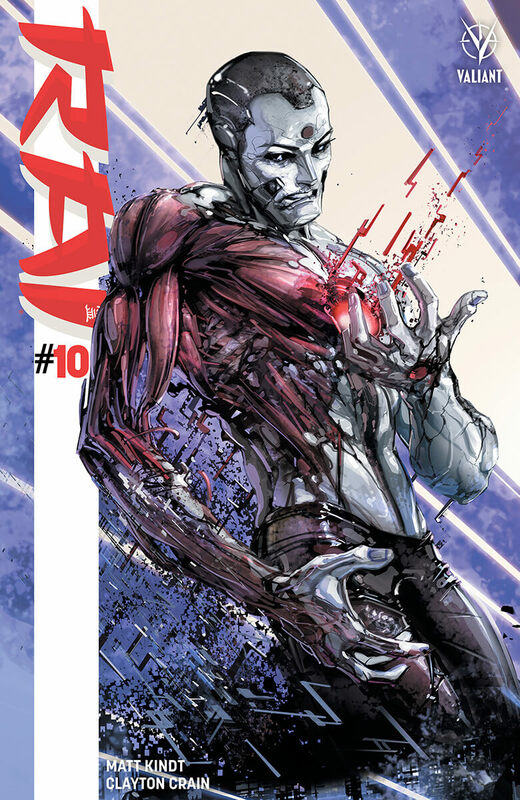 Rai #10 is must-read Valiant! Do yourself a favor give it a good read; you won’t regret it.